In this episode Lisa clearly answers the question, “Is there proof that strengths focused development works?” After looking at some business-related ROI, she offers a metaphor to bring the point alive with a visual. Lisa recommends this classic book by Donald O. Clifton and Paula Nelson, Soar with Your Strengths: A Simple Yet Revolutionary Philosophy of Business and Management. It starts with a simple fable and then transitions into the powerful lesson of focusing on strengths rather than spending your whole life trying to fix what’s missing or broken about you. What I have for you today is 1) proof points through some Gallup research 2) the other is a metaphor because it’s a really clear way of thinking and making it obvious that strengths-based development is the way to amplify performance on the job. First, for your proof point, some researchers at the University of Nebraska did a study to quantify the effects of what it is like when you invest in your strengths, versus when you invest in something that you’re just average in. Gallup has conducted a bunch of deep studies on strengths. The data shows that when a team or an organization has a strengths intervention, it can positively affect performance outcomes. Yeah, I know the word “intervention” sounds like a TV show for addiction issues, yet I promise it’s simply a term used by Organizational Development experts to mean that companies do more than just a single conversation about Strengths or StrengthsFinder – it’s when strengths are embedded in organizational processes. To read the nitty gritty details of the research, download Gallup’s 2015 Strengths Meta-Analysis. 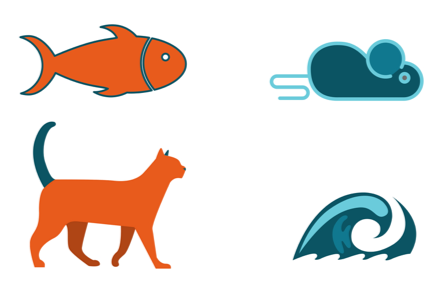 Ok, so got my weird HR conversation here and you can imagine how ridiculous it would be to spend a year trying to teach a fish to catch a mouse and how ridiculous it would be to get a cat to swim. But if you flip that around and send that fish to swimming school and make it the best fish on the planet, you can see what would happen. Oh yeah! That’s its natural tendency and that’s what it was made to do. Same thing with a cat. It’s made to catch a mouse. This is something that of course it’s not as easy and clear with human beings what they were born to do and we’re a lot more complicated because we’ve probably been squashing a lot of those things out of ourselves and hiding them and it’s more difficult to make them apparent. But even the notion that you as yourself or that you as a people manager are looking for the genius in that other person that is exactly the path that’s going to unleash performance in the organization. So get your fish in fish school. That’s the big lesson. Now let’s talk application. As you listen to this audio and think about yourself personally, think of a time when you learned something new and it came really easily to you…more easily than that same thing would come to most people. If you make yourself think of 5 or 10 of these types of things, you’re going to see some trends. You can extend those trends into your current role and think, “all right, if this stuff comes naturally to me, then how can I extend that into my current job?” If you want to apply the same question at a team level because you’re a people manager or you’re a strength champion (and awesomely) you are bringing this to a bigger conversation, then you can answer the question by going around the table and having a chat about it. Or, maybe you have someone in a project management role and they say, “you know, I can really spot the dependent tasks, I mean like nobody’s business…even when the rest of the team can’t see the connections. They’re oblivious to some of these things that are really connected to each other and are going to make the critical path, and others have to experience the whole thing to realize that some of those steps were connected and that they matter. That makes a great team conversation. Based on the size of your team, you can spend however much or little time you have for this. I’d recommend allocating about 5 minutes a person, so it might be a 30 minute conversation, but if you only have 5 total minutes to spare at the beginning of a team meeting, ask people to submit the answer to you in advance. Put it in a spreadsheet. Collect it before you show up in the meeting so that you’ve done the first-level work in advance. Then when you get in the room, it’s 5 minutes of, “Here we go. Rapid fire. How can we amplify this stuff?” And then you can take it further in the time that you’re actually in person together. Okay, with that, you have a new question. 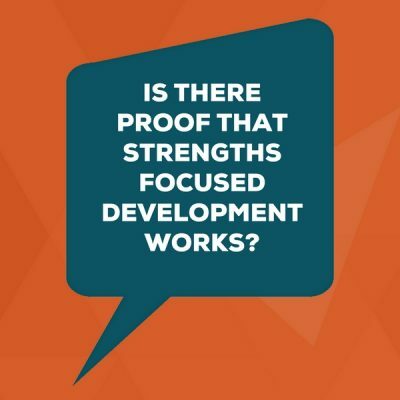 Hopefully you have a newfound appreciation for how strengths based development really does work – how it does amplify your performance more than an obsession with weakness-fixing would. Now you have some questions to discuss as a team, and some things to think about on your own so you can amplify your own performance at work, and the performance of those around you. So with that, I’ll leave you until next time. Thanks for listening to Lead Through Strengths. To find more strengths-focused tools, go out to our website at LeadThroughStrengths.com/resources. There’s a whole host of documents and videos and things that you can do to apply this on your team. I’ll see you next time.